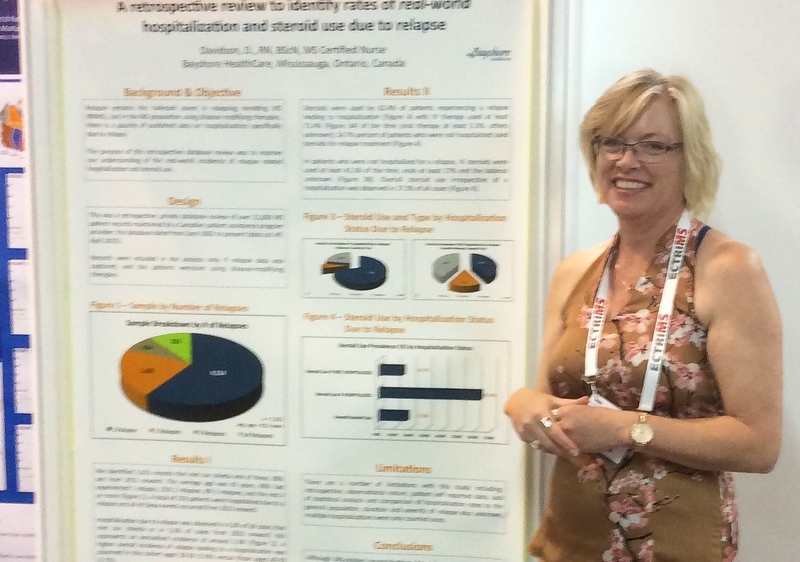 Deidre Davidson, a Bayshore HealthCare MS Certified nurse, presented an academic poster at a recent MS global academic meeting in Barcelona, Spain. According to the MS Society of Canada, there are 100,000 Canadians who live Multiple Sclerosis – one of the highest incidence countries in the world. MS can have a huge impact on everyday life for the person with MS and their families as the symptoms can be disabling and unpredictable. In the last few years, there has been a focused effort on research and development in the field of MS with regards new treatments and Quality of Life outcomes involving many stakeholders; patients, caregivers, physicians. ECTRIMS (European Committee for Treatment and Research in MS) is the largest global Multiple Sclerosis academic meeting worldwide. The 2015 meeting was recently held in Barcelona, Spain and was attended by 8,000 researchers, MS specialists and academics to learn and share ideas about novel upcoming therapies, stem cell transplantation and early intervention to slow the progression of the disease. As Canada’s premier provider of Multiple Sclerosis Patient Support Programs, Bayshore HealthCare is also able to provide a leading role in the reporting of real world evidence, patient data and outcomes. Bayshore’s 13 year analysis of real world evidence of hospitalization data due to relapse was transferred into an academic poster that was accepted and presented at ECTRIMS. Bayshore’s participation at key therapeutic global meetings such as ECTRIMS demonstrates our breadth of expertise and commitment to contributing to the scientific community worldwide in treating patients with MS.
Bayshore HealthCare provides exceptional care to people who have MS and we are dedicated to making a difference in our clients’ lives every day, every visit, every time. Where there is research, there is hope for a cure.